DELIVERING PROMPTNESS, ACCURACY & CREATIVITY! According to the Research Firm Gartner, Apple holds 36 percent market share on 70.4 million sales. The market share of Apple is expected to grow in coming years and why it wouldn't? Apple's iOS technology has showcased immense power and functionality to the mobile devices and has been the benchmark since the launch of app store. The technology continues to grow not only with popularity, but also with market share and wide acceptability. iphone app development is rapidly increasing in the market today because of its uniqueness, state-of-the-art technology, sleek design and individuality. We at Dot Technologies, specialize in providing robust and comprehensive iOS application development services catering to diverse business verticals. With our in-depth knowledge of the iOS app development process, we create stunning, user-friendly, portable and secure applications for iPhone, iPad, iPad Minis and iPod touch. Dot Technologies holds years of experience and knowledge in the IT industry. We ensure that your iOS application is based on your business that helps you to establish your individuality in the business market. In order to deliver surpassed iOS application development services, we at Dot Technologies, boast an in-house team of proficient and skilled iPhone developers. 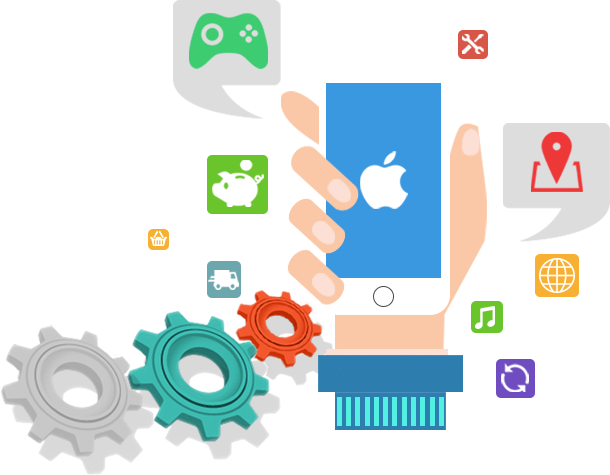 Our expert team uses logical iPhone app development approaches and proven expertise in developing cutting-edge apps for the clients. Examine and study your business objective. Delivering product/ services as per your needs and requirements. It is not just our iPhone app development process that sets us apart from others, but the amount of effort we put in to understand the intricacies of a project from technical perspective. We ensure that our clients get the best from our knowledge, experience and understanding. Our team of experts will work with you from the start till the delivery of the project.